Enjoy your summer days lazing poolside, fully satisfied that the work done now in rejuvenating the surrounding garden is the envy of all your friends and family. As with any garden design, the right plants create the theme or mood. Plants control the serenity, the amount of light that is allowed within the space, the sense of tropical lushness or mediterranean restraint. Whatever your style, be sure to carefully select your plants as the last thing you want to do is spend time cleaning up leaves, clearing blocked filters or replace plants that have invasive roots. To be honest some leaf drop is inevitable (either falling or blown in), but a good garden design will ensure this is minimal. The plants also need to withstand the intense sun's rays that are deflected off the surface water, plus the splash of chlorinated water. Tall plants or trees provide that essential scale and structure to a garden, a screen from the neighbours and of course shade. For that tropical look, palms such as Dypsis lutescens (Golden Cane) or Howea forsteriana (Kentia Palm) are ideal. Great understory plants within a tropical setting include bromeliads (particularly the Alcantarea's) and Gingers (a favourite of mine is Alpinia nutans Variegata). Strelitzia's (Bird of Paradise)are a great plant around the pool. They can be used within a partly shaded tropical plant palette or out in the full sun. There are numerous varieties, with the very large Strelitzia nicolai regularly used in lieu of palms etc. A Strelitzia reginae is featured within the garden bed to the left in the above pic. Note the use of pebbles as a mulch in this garden. 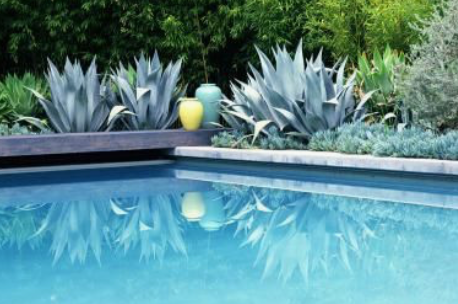 Succulents are a great choice for poolside plants. They are hardy, tolerate the splash, and many work well both in a tropical lush setting or a fully exposed pool zone. The Agave species are an all time favourite architectural plant, and as seen above they come in various shades of green/grey to green/blue. Be careful of those with thorns or sharpe leaf blades, however you will have plenty of choice with a softer leave texture. Other attractive succulents include the range of Crassula's, Kalanchoe's and Echeveria's. In the foreground around the pool above is the ground cover Senecio serpens (Blue Chalk Sticks). This is another hardy succulent plant, which provides great color variation within the greenery and nicely extends the blue hue of the pool water into, and amongst the plant garden. Note the lemon coloured pot, which in this case works a treat as a focal point within the pool zone. I will always advocate synergy between the architecture of the house and the garden. The form and colors of each must complement the other. If you have the room for the larger architectural Furcraea foetida Mediopicta (Mauritius Hemp), it lifts the personality of the pool zone with its golden yellow variegated leaves. It can be planted in the ground or in pots. This pool garden successfully combines the tropical theme against the outer boundary with the succulents or hardier plants in the pots. Within the pot is the very architectural Dracena draco (Dragon Tree) under planted with Senecio serpens. Dragon Trees can also be planted directly into the ground, where they may grow to tree size. Every garden should have it's very own personality, it's sense of character and style. The plants play a big part in that, as does the decor items such as pots and alfresco furniture etc. 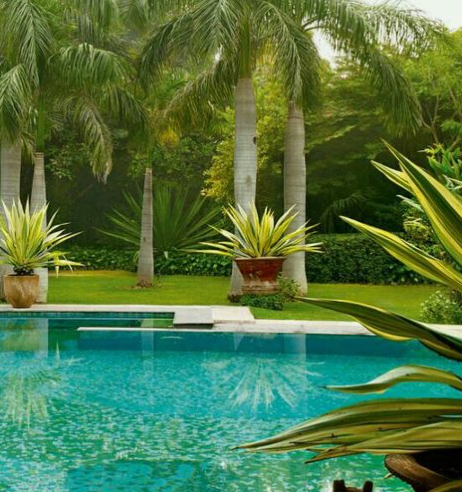 How wonderful is the personality of this pool zone, understated but elegant, clean lines enhanced by the defined garden bed in the foreground within the overall defined border of the pool. The stylish alfresco furniture nearer the home is similarly understated. Click here for more about garden design. I have only alluded to a few of the potential options for your pool garden. I am sure there some great options to consider for your space, so contact me now and let's nave a no obligation chat.